Like all stringed instruments, harps are a combination of art, science and tradition. It is helpful for those who play the harp to understand some of the most basic aspects of the way a harp produces its voice. This is one of those topics that can take you way down the rabbit hole but today let's leave the rabbit holes to the rabbits and only touch upon the essentials. When you pluck the string of a harp, you are sending energy into the string. This energy is vibrating at a specific frequency. You think of that frequency as a note. A number of variables will effect how much of the initial energy gets transmitted to the soundboard. Perhaps the most important of these variables is the mass of the string. As you can tell just by casual observation, some strings on your harp are quite thick while others are very thin. Varying the diameter of a string, along with increasing or decreasing the vibrating length of a string, changes the overall mass. Mass is also changed by altering the composition or configuration of the string. This is why some strings are plain monofilament nylon, while others have a nylon core with a nylon wrap around them while others have a steel core with a phosphor bronze wrap. It's tricky because often the nylon/nylon strings will be bigger in diameter but they will have less mass than a thinner wire wrapped string. Configuration gives nylon/nylon wrapped strings more mass than monofilament and composition gives wire wrapped strings more mass than both. In sound, just as an overall subject, high notes are produced by small, quickly vibrating frequencies. Low notes are the opposite. Those low notes have to move a lot more air (more on this later) than do high notes and moving more air requires more force. So, the massier (people say it but we all know it's not really a word) a string, the lower the note the string is capable of generating. This is because a massier string is a stronger string and a stronger string creates more force, that moves more air. Energy bounces from the inside of the front of the soundboard to the inside of the back. This adds to the vibration of the soundboard and the energy which creates the voice. 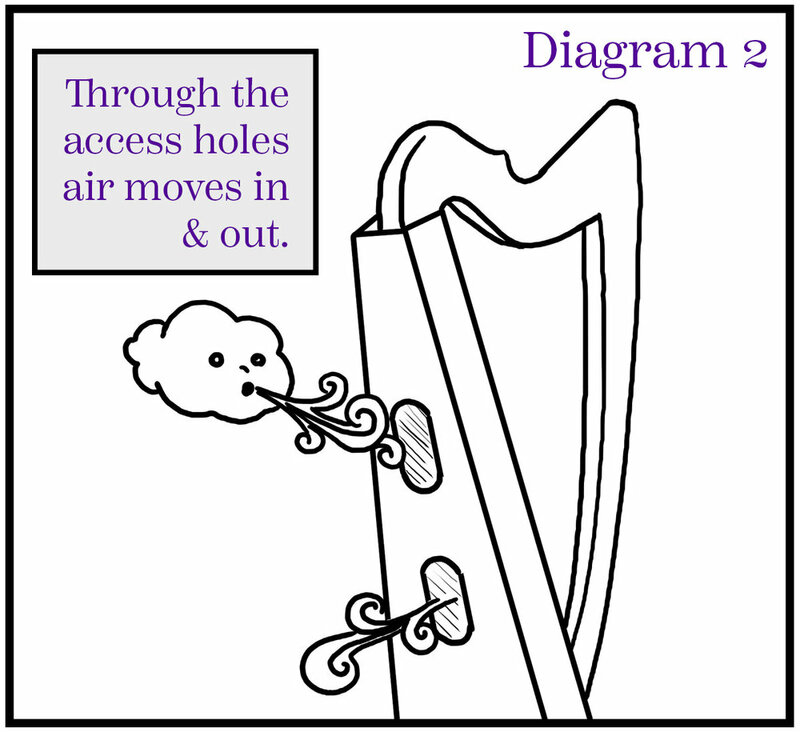 Air moves in and out of the harp as the soundboard rises and falls. Some people call the holes on the back of a harp the "sound holes." Because of this, many people think that the sound of the harp comes out the back. It is more accurate to think of these holes (and the holes on any stringed instrument) as air holes. Harps are a bit unique in that these holes also comprise the only access to the midrib and the inside of the harp so they provide the only way to get in to change the strings. This is why the holes are also commonly called access holes. Regardless of what you call them and in spite of the fact that some sound does indeed come out from them, they are not what generates the primary voice of the harp. When a string is plucked the string drives energy into the soundboard and the soundboard responds by vibrating. When it vibrates it is rising and falling. Now—imagine this next part all in slow motion so you can really wrap your mind around what is happening. When the soundboard rises there is more room in the soundbox. Because there is more room, air rushes in through the air holes. Then, the soundboard falls. When the soundboard falls, some of the air is pushed back out of the air holes but the rest of it gets slammed into the back of the harp. When that happens the back of the harp vibrates and it pushes that air right back toward the soundboard. What is happening here is that, in a well-designed and well-crafted harp, the back of the instrument is reinforcing the vibration of the soundboard and causing the soundboard to vibrate more effectively. In summary, the soundboard is rising and falling, the back of the harp is doing the same and they are combining to move a lot of air around. Energy pushes air off the front of the soundboard. The wavelength of the energy determines the note you hear. The energy which strikes your eardrum is what causes you to hear the harp. You have plucked a string, it has driven energy into the soundboard, the soundboard is vibrating and the back of the harp is reinforcing that vibration. This means that the front surface of the soundboard is vibrating nicely. As it does this, just as with the inside, the soundboard is pushing and pulling air. And here is where ears come in. Each time the soundboard rises it is pushing air, creating pressure waves. The air right around the harp is pushing on the air that is a bit further away and so on and so on. Eventually, there is an ear. The pressure waves sail right on in to the ear drum and press on it and wallah, a sound is born! The speed at which the waves press upon the ear drum will determine the frequency of the note the brain perceives as having heard. Perhaps you have heard that old saying, if a tree falls in the forest and no one this there to hear it, does it make a sound? While philosophers may ponder this, scientists don't. If there is no being with an ear drum close enough to hear the sound, there is no sound. A sound is what happens when an ear drum is activated. Nothing more, nothing less. If you look at most harps, you will see that at the top of the soundbox the soundboard is closer to the back than it is at the bottom. Overall the back is tapering away from the soundboard. Rees harps, be they Harpsicle® Line or Rees Concert Line harps are an exception...for a really good reason. Now ask yourself this, since, as we have explained, a harp voices much more advantageously if the soundboard and back work together effectively and we also know that the human ear is not especially efficient in the low range of frequencies, why on earth would anyone build a lever harp where the soundboard and the back taper away from one another? This is cutting down on the performance of the soundboard right in the area where the human ear needs it to be the strongest. One of the key reasons Rees harps are known for having a big and balanced bass that isn’t muddy or thumpy is because the back of our harps always runs parallel to the soundboard. We want to give your audience every opportunity to hear everything you play, even (and perhaps especially) if your audience is just your beloved family house rabbit.